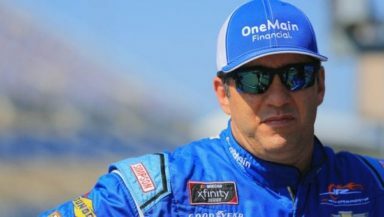 After a hard fought fifth place finish at Road America last week, Elliott Sadler clinched a spot in the NASCAR Xfinity Series Playoffs. As he heads to Darlington Raceway this week he has a new goal – to win. Sadler won the VFW Sport Clips Help A Hero 200 in 2016 and feels confident that his JR Motorsports team can visit victory lane at the 1.366-mile track once more. On August 15, he announced that this year would be his last full-time season making this his last chance to repeat and tame the “Lady in Black” again. His stats at Darlington paint a hopeful picture. In 14 starts, Sadler has five top-five finishes and six top 10s with one pole award in 1997. In his last five races at the track, he has finished second twice (2013, 2014), earned an 11th place in 2015 and scored a win in 2016. Last year he finished 33rd after being involved in a crash. Sadler commented on the upcoming race, saying, “This is one of my favorite race weekends of the year. Darlington Raceway has always been a special track for me and seeing all of the retro paint schemes always brings back good memories. My Armour Chili team has one goal this weekend – of course, aside from winning – and that’s to earn as many points as we can. This year will also be his last opportunity to win the Xfinity Series championship. In 10 years of full-time competition in the series, Sadler has finished in the runner-up position four times – in 2011, 2012, 2016 and 2017. There are only three races remaining before the series crowns the regular season champion, awarding that driver 15 playoff points. Sadler is currently third in the standings, 12 points behind leader Justin Allgaier. A win and/or playoff points this weekend could propel him to first place and one step closer to a championship. Tune into the Sport Clips Haircuts VFW 200 on Saturday, September 1 at 3:30 p.m. ET on NBC with MRN and SiriusXM NASCAR providing radio coverage.